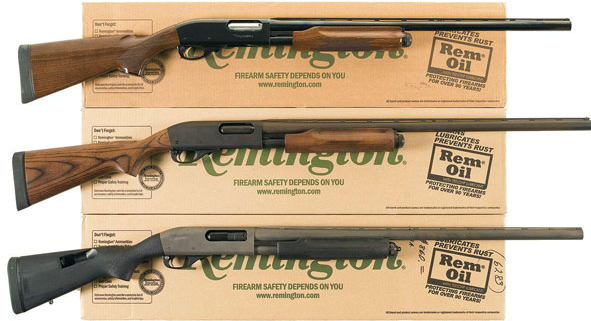 Remington’s long line of firearms has many guns which are considered classics. That almost seems inevitable if you’ve been producing quality firearms for as long as Remington has (200+ years). Remington’s innovative team of engineers, scientists, and former military/law enforcement personnel has continuously been changing the face of American firearms, and one of the finest things they’ve ever produced is the Model 870 pump-action shotgun. It truly is an American classic and has been one for over half a century. First produced in 1951, the 870 is one of the models most associated with Remington. It is right up there with legendary Model 700 bolt-action rifle, which was released about 10 years after the 870 shotgun. It is iconic, to say the least. Nowadays, there are many variants of the Model 870 available, and they are used for hunting, competition, self- or home-defense, and tactical military/law-enforcement uses. Here’s a glance at some of the tech specs of the Model 870 Express, available in 12 gauge and 20 gauge. We’ve heard the demands: welcome to our Remington Model 870 Tactical Shotgun Review. Introduced – 1987 (Express models). Seemingly, nothing too special. But the secret to the 870’s success is not really in the specs. The 870 is truly greater than the sum of its parts. The price is right, for sure. The MSRP is usually much higher than the street price. Some people assume that lower-priced Remington models are garbage (think about the poor reactions which the Model 770 has received…) but that is not necessarily the case. Just because something is more wallet-friendly, doesn’t mean it’s junk. Made with a 3-inch chamber, the 870 Express can fire 2¾-inch and 3-inch shells. The newer Super Magnum versions can even fire 3½-inch shells. The Express is built with a hardwood stock and foregrip, and it feels really great to hold. It really feels like you are holding a piece of American history, and there is a lot of pride that comes along with that. I know that some say that weapons are nothing to be proud of, and, well… I disagree. The intent of shotgun firing may be lethal but just look at the engineering behind the thing. It is a work of art, and that is something anyone can – and should – appreciate. Plus, there is also a defensive aspect to consider. The Model 870 is used by military and police units all around the world, and you can certainly see it has had a wide impact, globally. Like I said, it is an icon. 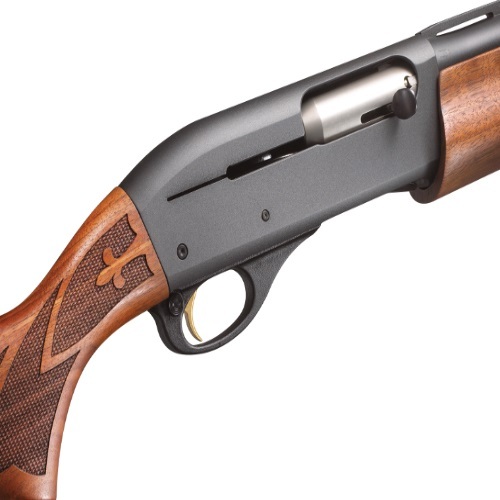 The Express is built a little differently than the more expensive Wingmaster series, but it still retains all of the attributes necessary for a proper shotgun. It is dependable and precise. The receiver is made from solid steel. The action is built in a way which prevents a huge kick, even with 3-inch shells, and allows follow-up shots to leave the gun quickly and easily. The Express’ stock is either laminate or synthetic, with varying finishes. There are many aftermarket stocks to choose from as well. There are also compact and junior versions of the Express, which lessen the length of pull of the shotgun and allow for younger or smaller arms/hands to take part in shooting this firearm. The pump action is great. I love that feeling when I rack the thing. It is so empowering. Say what you want, there is a certain energy, a feeling of power, when you handle this kind of shotgun. More, perhaps, than handguns or other kinds of firearms. When I take this workhorse of a shotgun in my hand, it sends vibes up and down my arm. And it isn’t just about the satisfying kick. It is about the two action bars which work so very smoothly. Again – you don’t need to spend a ton of money to own a quality shotgun. The Remington 870 Express has stayed popular for 30 years or so, and that means something. 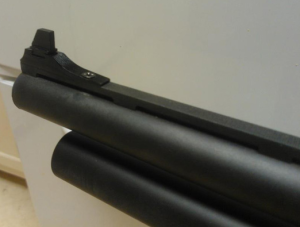 The standard internal tube magazines of the 870 feed four rounds to the chamber, where one can already be inserted (in other words, 4+1). There are magazine extensions available for civilian, law-enforcement, and military uses, which can extend the capacity of the Model 870 to 7+1 rounds. The standard sight which comes with the 870 Express is a single bead sight. There is the option of adding anything from a scope to a reflex or red-dot sight. A ventilated-rib bead sight is a great starting point, and if you find that you require other kinds of aids or optics, go for it. The Model 870 is versatile enough to accept all kinds of modifications. There is a safety switch, located right next to the trigger, behind the trigger guard. There is a simple indication: if the switch is sticking out, the gun’s safety is engaged. Operated in the easiest way by use of the trigger finger, it is a safety which may prove to be an issue (and in some cases, a veritable deal-breaker!) for left-handed shooters. For this reason, and others, there is a left-handed version of the 870 available. Remington has you in mind, lefties! This gun can be taken apart easily, once you get the hang of it, and it is just as easy to reassemble. Watch out for the pressurized magazine spring, and be sure to wear proper protection. It takes a couple of times to get it. Work slowly and accurately – you don’t want to mess anything up. The pins, bolt, trigger group, and carrier are all very durable and easy to handle, but they are also small. Variants of the Model 870 are many. There are a ton of them, and the most well-known ones belong to the Wingmaster series or Express series. 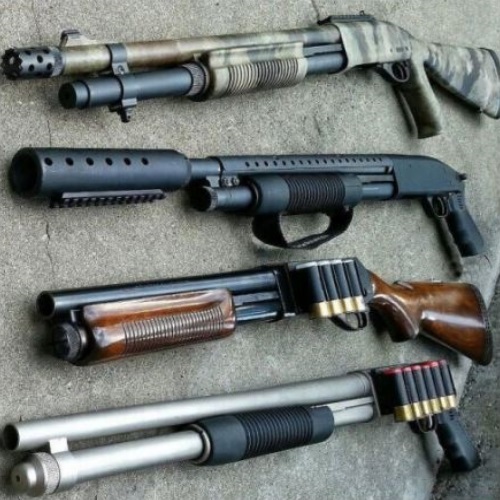 The Super Magnum (able to fire 3½ shells), the nickel-plated Marine version, and the specially-stocked Police version (12-gauge only, 18- or 20-inch barrel) are also very well-known. I already mentioned my ideas on the 870 Express’ price earlier. It is an inexpensive version of the Wingmaster, which dominated the scene for a long while before other models were made available. When the Express line was introduced, the sales of 870’s went way, way up, and with good reason. Over 10 million units of the 870 have been built since its inception, and the numbers keep on rising. The Express line has a lot to do with it, but even other models can be found for very affordable prices. You need to look around, check out gun shows, bidding sites. With so many Model 870 versions available, there is no doubt you will be able to find one which fits your desires, your passions, and your pocket. The differences between 20 gauge and 12 gauge shotguns are already well-known and documented. 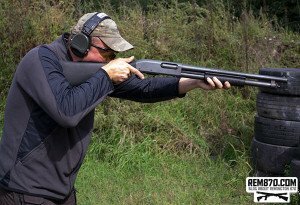 When it comes to the Model 870 Express, the differences are not too many. 12 and 20 are the only gauges in which the Express is offered, but other versions of the 870 are available in 16 gauge, 28 gauge, and .410 bore. The 870 Express has 3 12-gauge options (one being the left-handed Express), and 7 20-gauge options. Folding Stock: For close quarter encounters, this is a must. It also makes transportation easier and allows the gun to be fired from a variety of positions. Pistol Grip: Ideal for home-defense situations, and it allows one-handed shooting as well. Holding a pistol grip generates stronger tension, and that can be a real game-changer for some. Rifled Slug Barrel: A smooth bore is great, but there are certain times when only a rifled barrel will provide you with the necessary range and speed. Camouflage Sets: Stocks and forends are some of the most sought-after aftermarket purchases for the 870s, and the camouflage finishes are proving to be a popular option. Turkeys and other game have sharp eyesight, and you want to be prepared. Two shotguns which are often compared, and for good reason. The Mossberg is a lot more defense-oriented than the Remington, which is more of a hunting shotgun. The 870’s action is a lot smoother. There is a ruggedness or roughness to the action of the 500, which isn’t bad, per se – just not as smooth as the 870. Obviously, with time and use, the action of both shotguns becomes smoother. Once you break a gun in, it has the potential to become a very different firearm. The receiver on the 870 is solid steel, whereas the 500’s is an aluminum alloy. This makes it lighter, yes, but there is something about a good old slice of solid steel. Besides, the weight issue isn’t an issue at all, since the difference is pretty negligible. The capacity of these two is a major difference since the 870 can be fitted with a mag extension. 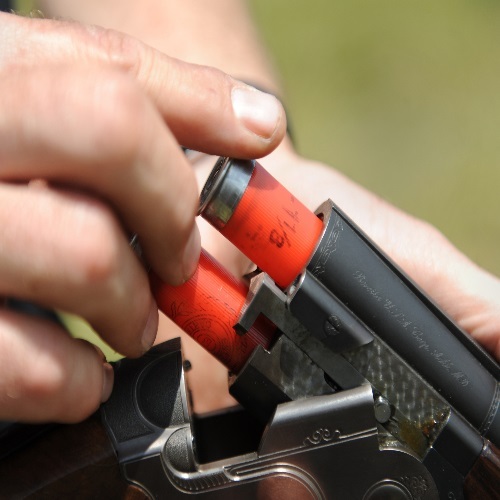 The 500 cannot be extended as easily, which is why if the round count matters to you, pay attention and get the proper shotgun for your needs. These two have different loading gates. The 500 is open, and the 870 is closed. It is a matter of personal preference, but the Mossberg 500 open gate offers less snag-ability. Both are high-quality shotguns, and it comes down to personal preference. Out of the box, it seems the 870 does have something of an edge. Either way, you are going to be happy with your purchase. The 870DM is Remington’s newest take on home-defense and is one hell of a fast-loading shotgun. By offering a 6-round magazine, incredibly intuitive controls, and a Supercell recoil pad, the 870DM is not your run-of-the-mill scattergun. Like classic Rem firearms, this guy is built with a nice balance between steel and synthetics to keep reliability up and weight manageable. The Remington Model 870 is a shotgun you can really have fun with if that is your intention. The combination of wood and steel is irresistible. It is an old-school kind of shotgun by design, but it can prove to be real competition even for the more modern shotguns. A great shotgun with a pocket-friendly price (usually), which can be used in a wide range of situations and scenarios. An American icon. Can’t get enough of Remington? Check out our Model 1187 and R51 reviews here at Gunivore!